I have always been quite self-conscious about my teeth they are quite stained as I drink a lot of coffee and tea and I have tried my fair share of whitening tooth pastes with little luck. So when this arrived on my doorstep I wasn’t expecting much really. Just a bit about the brand as it is new to SA and I don’t think many people know about it. Elgydium is a brand originating from France which celebrities are actually known to buy by the case load in boutique French pharmacies. The magic ingredient that sets Elgydium apart is “Micro-Pulverized Sodium Bicarbonate.” This is 5 times smaller than standard sodium bicarbonate (aka baking soda), this soft crystalline substance dissolves readily into even the tiniest fissures of enamel. As the smaller-sized sodium bicarbonate particles infiltrate the crevices of each tooth, they break up stains from coffee, tea, and smoking. Not only does it gently polish teeth with mild abrasive potential, but it also kills on contact all motile microorganisms associated with periodontal infections. Additionally, sodium bicarbonate neutralizes and detoxifies the bacterial acids that form in plaques, or bacterial biofilms. To be honest though I didn’t notice a dramatic whitening effect after using Elgydium day and night for 3 weeks, I did see a subtle difference upon first use actually, more than I have with the other whitening tooth pastes I have tried. The brightening and polishing powers are rather gentle. You may get Also with most tooth paste when you glide your tongue across your teeth you may get that gritty feeling of residual plaque this is not the case with this tooth paste. Elgydium Sensitive is specifically formulated to relieve pain associated with dental hypersensitivity. The patented active ingredient, Fluorinol (fluoride), adheres to the tooth 5 times faster than any other fluorides. It is extra-gentle to protect sensitive gums and teeth. It rapidly and firmly binds onto tooth enamel within the first minute of brushing offering effective protection. It closes the tubuli and stops nerve impulses that create discomfort. Elgydium Sensitive has a refreshing mint flavour. I don’t particularly have sensitive teeth but I did appreciate that it left my teeth feeling squeaky clean and fresh. The may box was dedicated to hair. This box was absolutely amazing definitely in my top 3 boxes I’ve received. A good hair month this was indeed. One of my top hand creams it light on the pocket, smells amazing, is a natural product packed with anti ageing properties like retinol and SPF, absorbed really quickly into the skin and leaves my hands feeling soft and pampered. I was introduced to this hand cream a while back in a past rubybox and I definitely always come back to this one. Popped this into my handbag as soon I opened the box very nice handy travel size. Was most excited to see this massive bottle in the box as there is a growing trend with hair oils lately. It complements greatly with the massive box of john frieda I was spoilt with a few months ago their products never disappoint. Firstly it smells absolutely amazing. I used 2 pumps as my hair is quite long after washing and followed by blow dying to help the product seep in better and my hair definitely felt smoother and looked more hydrated. You might find the idea of putting oil in your hair a strange concept but it is so light weight I didn’t even notice it was there and even if the scent bothers you I barely noticed the scent after applying it. I also like to apply this after I have curled my hair to give it more shine and over just washed hair to tame fly aways and frizz. Perfect for the cold winter that has come upon us as skin tends to dry up and get red and itchy and I know it’s horrible to bath in hot water but it’s a bad habit that keeps me warm and relaxes me but horrible for the skin. This is why Nivea invented an absolute god send. Saves so much time as sometimes I skip moisturiser and later feel the side effects and still end up running to my body lotion. You just wash as you usually do then slap this on and after a second I rinse off and get dressed as usual no more waiting for moisturiser to sink in before dressing. Smells like the normal nivea scent. It leave my skin feeling soft and not sticky. This is even better than a traditional body lotion in my opinion. Nice comb for parting and detangling hair. Say goodbye to skew partings with this nifty trusted tool. This one is exclusively available at the rubybox boutique. Love this. Can’t have enough headbands. This one looks very stylish and holds the hair back nicely . The multiple strands let’s you get creative with your hair. Will be using this soon after winter. This is a great hair dressing salon. 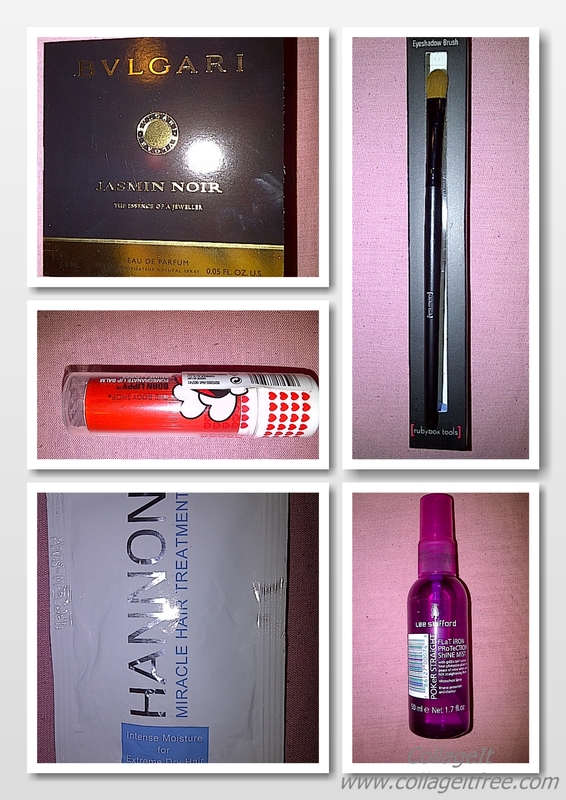 So if you want to #surpriseyourself with these type of beauty treats you can sign up at http://bit.ly/1ao5VSz There is an amazing promotion to get your first box at ONLY 99 cents I doubt you can buy anything for that price these days and nice if you want to try out the rubybox experience. This month I will be showing you 2 variants of the April box. 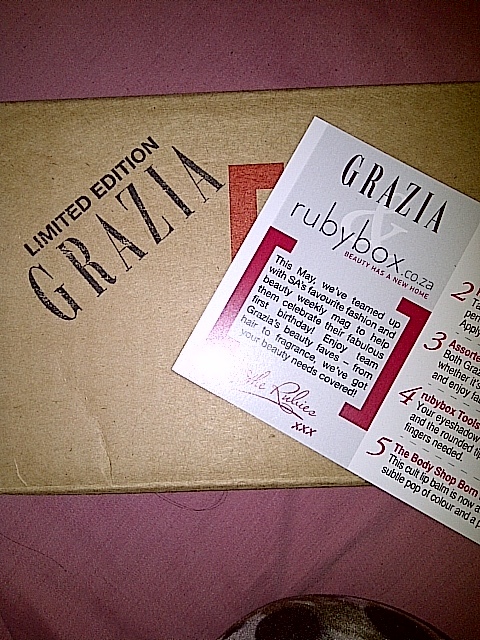 This month they arrived nice and early and saw the release of yet another exciting rubybox beauty product exclusive. So let’s get down to content. Produced with just five ingredients to give a lasting moisturizing effect even for the driest most hypersensitive skin. Safe for use in eczema and psoriasis. Without fragrance, mineral or essential oils, Plain Ordinary Moisturising Balm is fit for the most difficult task. It can be applied anywhere on the body from head to toe. It is safe enough to use on a baby, and to soothe irritated and inflamed skin. Try it as a lip balm, or a make up primer.Natural balm beads may form; they dissolve into the skin as soon as it is applied, gently relieving dryness, without being greasy.Vegetable wax, olive wax, grape seed oil and beeswax.There are essential oils, no preservatives, no petrolatum derived products, no SLES products, and no frangrance. Which makes it safe to use in eczema, psoriasis and other related skin conditions.A little goes a long way. Use a small amount and massage gently into the skin. The balm sinks in and leaves a long lasting silky feel.Try it on your lips, as a make up primer, on cracked heels and elbows, baby bottoms, after shave rashes, when exposed to the elements, skiing, surf and sand, sunburn, wind chapping, or as a all round must have moisturiser. This was very impressive as a great multi tasker and made from all natural ingredients. I enjoyed using this as a face moisturiser and lip balm. The ultimate in gentle cleansing. Its super mild, milky-lotion texture eliminates all traces of make-up and impurities, while respecting your skin’s natural protective moisture barrier. In one simple step, your sensitive skin and eye area are perfectly cleansed, without any itching or tightness. Instantly, your skin feels soothed and comfortably fresh.The plus: a fragrance developed to minimise risk of allergy. Very nice gentle cleanser. Eliminates impurities and makeup as it tones the skin.A light and fresh water specially developped for normal to combination skins that eliminates impurities and makeup in a simple step without drying skin.Result: face and eyes are free from makeup and skin is luminous and moisturized.The Plus: two benefits in a single product.Tested under dermatological and opthalmological supervision.No paraben, no mineral oil, no coloring, no silicon. This could easily replace my bioderma sensibio H20 makeup remover. This is so gentle and doesn’t dry out the skin as it does not contain any alcohol. Long lasting, chip resistant colour. Creates a flawless finish with the unique, precision brush for professional results, more shine and nourishing care.I received “Lacquer in Siren” A sheer nail lacquer in a bold red shade and “By The Seaside” A shimmery nail lacquer in a glittery sea blue shade. This is an amazing fruity floral that smells exactly the same as my favourite fragrance Issey miyake l’eau d’issey florale. So I was very pleased to receive this. 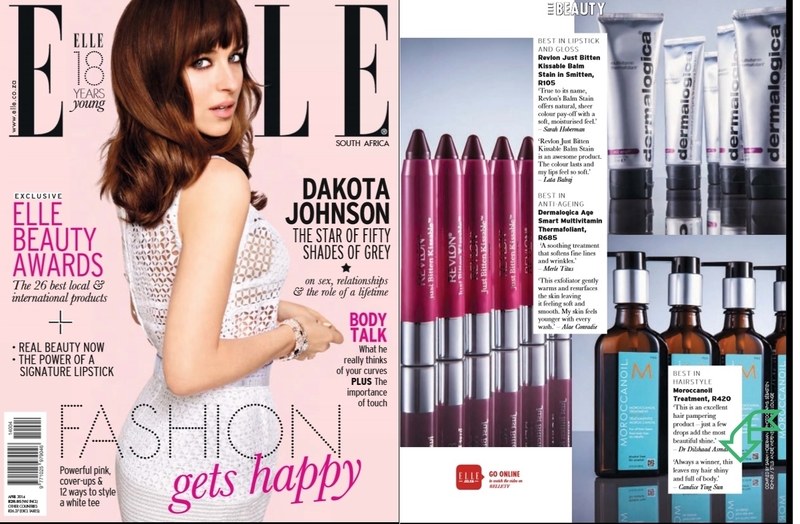 This is a proudly south african brand packed with all natural ingredients. The marula oil and olive leaf penetrates the skin below the surface and treats dry skin and fine lines. I get an uneasy feeling when I see products specifically fomulated for dry skin as they often make me look like an oil slick the next morning but this one really surprised me as it moisturised really well but still nicely matified my skin. A nice lippie with an SPF to apply before the lipstick that came in the box. Can’t get over the amazing vanilla scent of this one. Was interested to give this one a go as I have had many situations where I have forgotten to apply a roll on or the effects have worn off by the time I gym in the evenings and perfumes can’t cover that horrid scent. Wow 2 clicks of the applicator applied to arm pits before bed and 48 hours of protection sounds like a miracle in a bottle. And wow was I impressed even hectic scrubbing while shower does affect the lasting power and it doesn’t contain any alcohol, it is quite creamy and moisturising and it dries in a flash unlike normal roll ons where I have to wait at least 5 mins before I dress in fear of ruining my clothing. This lippie has gorgeous colour payoff and fades subtly throughout the day. Perfect colour to pucker up for vday. The packaging looks sophisticated and is sturdy. The scent is a pomegranate scent but luckily is not that noticeable once applied. It also has a nice shimmer in it. A nice snack for the day. 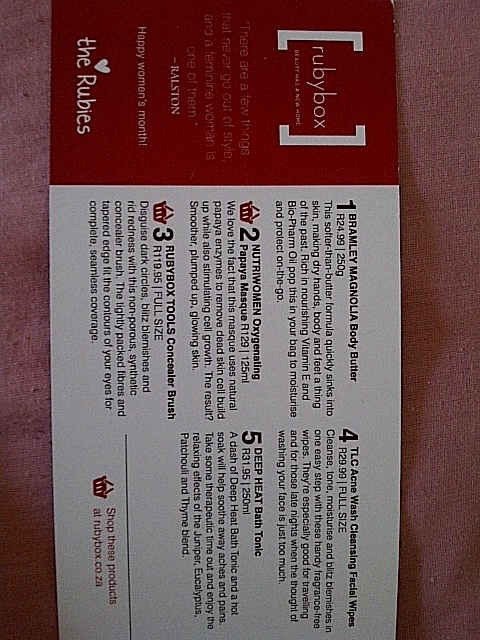 If you want to subscribe to rubybox you can click here. I’m really excited about the L’occitane box next month! November was the month were the rubies celebrated “green” so all boxes contained green products. 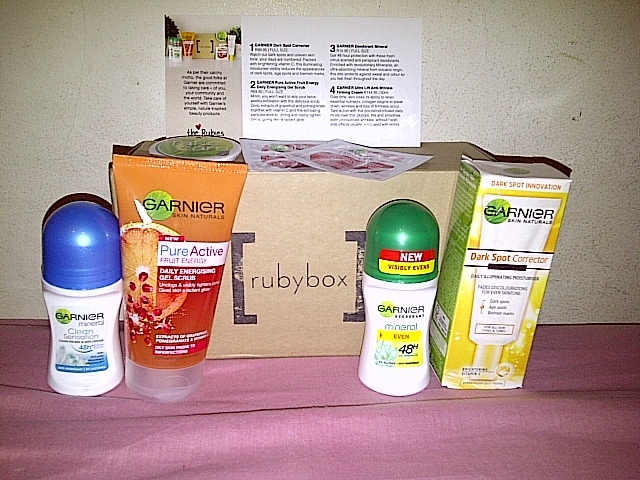 Rubies had the option of opting in for the Garnier box. 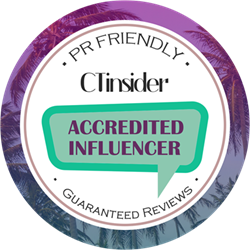 Garnier’s moto is take care which means that they are committed to taking care of you, your community and the world with their nature inspired beauty products. This box had all full size products except the ultra lift cream which were sachets which was well worth the subscription fee. The game changing ingredient here would be the vitamin C as is known for its beneficial healing properties for the skin. It is really light comes in a nice squeeze applicator tube. It claims to visibly reduce the appearance of dark spots, age spots and blemish marks. This stuff smells amazing and the scrub is gentle enough to use daily. After a wash my face feels so refreshed. Main ingredients are vitamin C, grapefruit and pomegranate. Exfoliatiting particles help to remove dead skin thereby revealing more radiant skin and unclogging pores. These offer 48 hour protection! I tested it for 20 hours and it worked just great. Smell amazing, dries really fast and leaves underarms sweat free and nicely scented. A nice anti ageing cream to target wrinkles and firmness. Nicely scented quick absorbing cream. 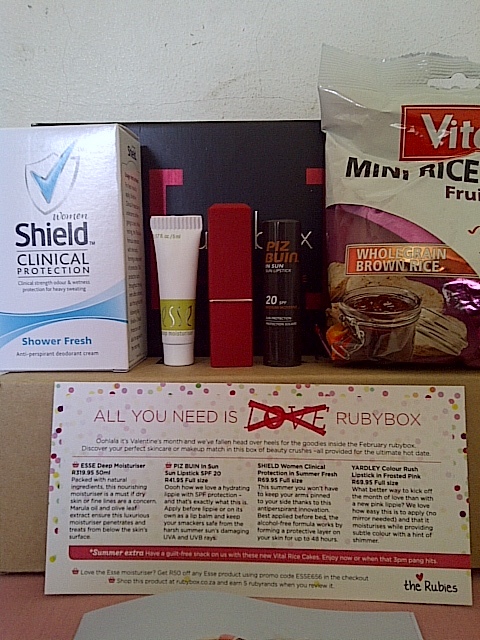 This month the rubies were spoilt with the new rubybox packaging and a box full of amazingly scented treats. 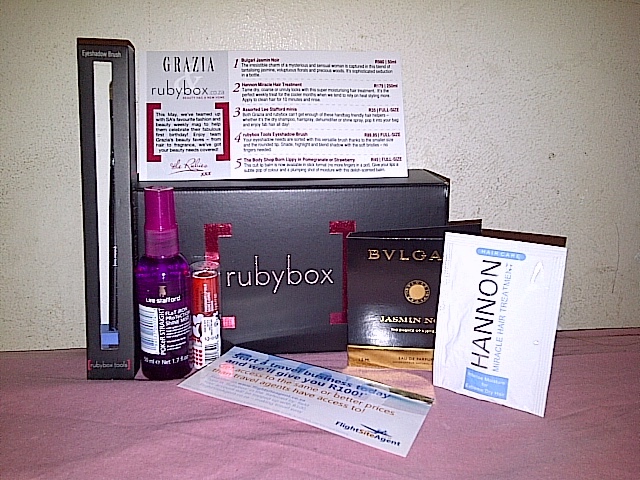 Most of the products I haven’t tried before which is why rubybox is such a great concept. A lovely smelling soft buttery formula enriched with vitamin E and Bio-pharm oil sinks in really quickly into the skin and is very moisturising. This is such a cute little sample and is perfect for keeping in my handbag. Such a great addition for the winter months. When I opened the box this is the amazing scent I was greeted with. This masque uses natural papaya enzymes to remove dead skin cell build-up while stimulating cell growth. After this mask my skin felt so pampered and smooth. Always excited to see another addition to the rubybox tools collection. This little made of synthetic fibres ensures that the brush does not absorb all your product, can be used to blend and apply any type of concealer. The fibres of tightly packed to give a more natural even coverage. The tapered tip allows for precise application. This brush is such a great investment. A handy re-sealable pack is great for those late nights when you just want to pass out. I have used many types of cleansing wipes before and was quite surprised by the fact that one wipe can cleanse, tone and moisturise whilst blitzing blemishes. While I wouldn’t use this daily because I have a really tedious skin routine with serums and many more serums I think this would come in handy if I am just too tired to wash my face properly. Quite moisturising and didn’t dry out my skin like many items that contain salicylic acid. The ultimate treatment for aches and pains. This liquid foams up very nicely and contains juniper, eucalyptus, patchouli and thyme which has a very calm and relaxing effect. I must admit that I have steered clear of any type of deep heat products since I can’t stand the medicine type scent but to my surprise this one is somewhat bearable. So what’s in store for next month? September marks the start of spring and -more importantly- our 2nd birthday! Join in the celebrations and you’ll get an elegant birthday present in your September rubybox, PLUS your choice of an extra 3 free samples! Simply add a rubybox subscription to your cart, and you will automatically be redirected to select your 3 favourite samples before you check out. When it comes to September’s monthly beauty surprises, join rubybox on a celebratory trip around the world… In America we pick up a signature scent from a young star, before we cross the Atlantic. In London town we’ll be Freida of our fine hair woes, and then meet up with a crabby lady of luxury. Crossing the channel we’ll hit the continent – and the catwalks too! Top European designers have bottled their style in the form of lavish beauty products, and we suspect you’ll love their skincare as much as you love their shoes. So if you haven’t signed up head over to rubybox.co.za if not just for the box but also for the great brands that they have made available to SA and also the amazing specials from the boutique. This month we were spoilt by team Grazia’s beauty faves when rubybox teamed up with Grazia (A fashion and beauty weekly mag) to celebrate their first birthday! This is meant for the mysterious and sensual woman with a blend of jasmine, florals and precious woods. This one is a really sweet woody scent and I really do enjoy the Bvlgari range. Experience an immediate improvement as unruly coarse, brittle and frizzy hair gets transformed into silky, soft and shiny hair with the super moisturizing treatment. This treatment is ideal for hair which is naturally dry or has been dried out by regular heat styling and exposure to the elements. I love the heavenly scent of vanilla and my hair felt much softer after applying. It really is a miracle treatment that works in 10 minutes. My hair definitely needed this. Now I’ve tried a lot of heat protectants and they have always left my hair feeling greasy and heavy but with this one I don’t feel it in my hair at all. Heat protectants are an absolute must when you use heating tools and I even use it when I blow dry my hair. It may specify use with a flat iron but I use it with my curling tongs too. My hair looks much shinier and not dry. It contains green tea which protects the hair and prevents it from going static and protects the hair from UV and environmental damage. Plus I find the scant rather pleasant. This brand has won numerous awards so I do suggest you give their range a try. Another amazing addition to the rubybox tools brush collection. This gem is very versatile and serves all your shadow needs thanks to the smaller size and rounded tip. You can shade, highlight and blend shadow with this little brush. The super soft bristles of the brush worked well and didn’t absorb much of the eyeshadow. 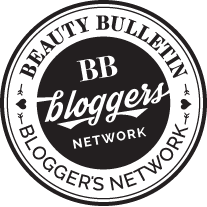 This buttery balm is extremely moisturising with a very nice fruity smell. I do notice a slight orange/red tint but very subtle and hardly noticeable which is great since I like to layer lipstick over it. This gives a nice shine to the lips and I find the graffiti like packaging to be really cute.